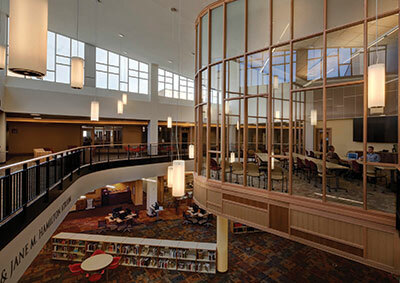 When the University of Denver embarked on a major interior renovation of Penrose Library, the institution's main library for more than 40 years, what it had in mind was more than the modernization of brick and mortar structures, and more than the incorporation of new technology into updated physical spaces. The institution saw an opportunity for a fundamental rethinking of the use of space in order to provide the technology-enhanced services that support the new ways people work and learn in a digital environment. Nancy Allen, university librarian and dean and director of the University of Denver's new Anderson Academic Commons, led the effort to transform the old physical space into a learning commons that has become the intellectual heart of the campus, chock-full of collaborative spaces, high-tech meeting rooms, academic support centers, social areas and more. Opened in 2013, the facility offers ample technology-infused spaces for collaboration, increasing the number of group study areas — all complete with flat panels and other collaborative technology — from seven to 32, and providing larger meeting and conferencing spaces that feature high-quality image capacity, built-in camera and recording technologies and motion-directed acoustics. The new academic commons hosts exhibits and conferences, enhancing its importance as a community centerpiece. The Anderson Academic Commons also recognizes the importance of traditional, paper-based materials, maintaining about 40k linear feet of shelving within the commons for very select collections while moving the vast majority of its tangible resources to an off-campus facility. Delivery of requested materials is offered on a fast-turnaround basis, several times a day, giving users the same or better access to those materials than before the renovation. An array of academic support centers have found their home in the commons, including the Writing Program, the University Technology Services help desk and a tutorial center (with the growing participation of math, physics, chemistry and engineering groups). A full-service café inside the building is a welcome feature for students who spend long hours at Anderson. And the Office of Teaching and Learning, the organization serving faculty with pedagogical support, is also located in the facility. The extensive renovation involved work with several architectural and technology consultants as well as product vendors and contractors too numerous to mention. Major architectural and technology design consultants and contractors on the project included H+L Architecture, Martin/Martin Consulting Engineers, ME Engineers, Cator Ruma & Associates and Rimrock, a BCER Group. Significant technology and vendor contractors included Atlas Sound, Biamp Systems, Chatsworth Products, CommScope, Crestron, Gallun Snow, Listen Technologies, Panasonic, Sharp and Shure. Beyond the enhanced digital services and student support centers at Anderson, there's an important element of student comfort tied into the design of workspaces. As Allen explained, "Students can choose where they want to be — whether they want to sit in social seating or solo seating … if they want quiet seating or if they want to listen to the buzz of the espresso machine … or if they'd like to sit by the fire…. They get to choose, and there's enough seating throughout the building in different categories that satisfy individual student needs, that they are happy with their use of the space, and ultimately, they succeed."